A workshop on Child Poisoning First Aid, jointly organized by CIPRB & Australian Safe Communities Foundation (ASCF), funded by Australian Aid, was held in Raiganj field office, CIPRB on 26 August 2015. 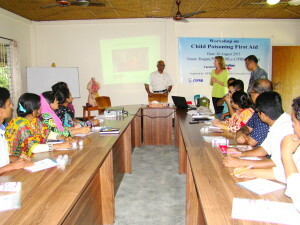 Ms. Teresa Mary Barter from ASCF was the master trainer and 18 participants took part in the workshop. Prof. Dr. AKM Fazlur Rahman, Executive Director, CIPRB inaugurated the workshop. “What would be the first aid treatment if children swallow cleaning products, such as soap, shampoo; insecticides; pesticides; herbicides; medicines etc.” was the most important part of the programme. First aid treatment for snake bite was also an important issue there.